I can't wait to retire. I am hoping to do it much much earlier than average. I could easily enjoy my days spending time at the local military museum, designing models, building, reading, cooking, and hiking. If you make it 13.4" you'll end up with a 1/48 scale model. Oh, I have plenty of stuff I want to do... but going to the office is not part of it. There are plenty of projects I want to work on and things I'd like to study... I just don't have the time or mental energy while working. 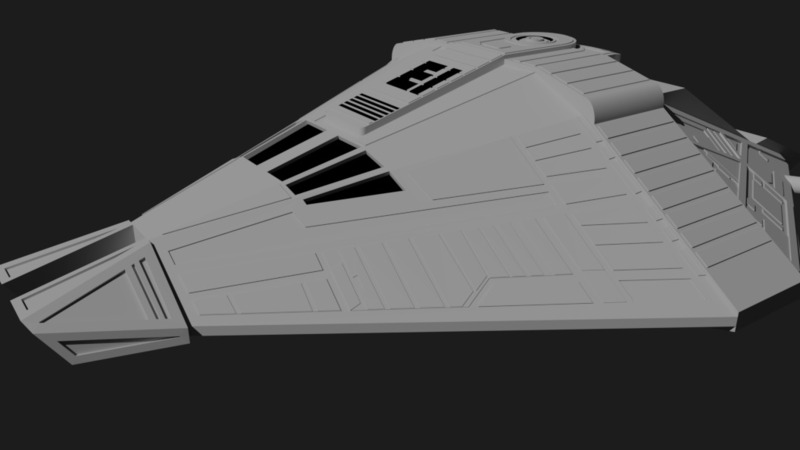 But I am making more progress on the shuttle. I hope people like laminating parts, because there are a zillion raised or recessed panels on this thing. And it looks as if there's a decal on each panel. Yes, definitely. I already spied some errors on my part on this 2nd attempt... but I am moving forward. There is going to be a lot of layering to add depth to the panels. WOOOT!!!! This is awesome!!! The Narcissus is the only main ship from the classic Alien Saga that is still missing in paper form (we already have RMT's Nostromo, Jan's Sulaco and the marvellous Derelict ship and the Betty). BTW, the models from Alien and Aliens are not the same. They differ in certain aspects. I'm looking forward to seeing your updates. Dude, it's just a dream that comes true... Just can't remember how many years I'm looking for Narcissus model. Hope is hard to kill.